We had visitors to the bubble rock a couple of weeks ago. Actually, our little watering hole attracts a lot of transients, especially on those really hot summer days when any supply of fresh running water ~ for drinking and bathing ~ is a welcome relief. On this occasion a flock of young Blue Jays ~ about five or six of them ~ stopped by for refreshment. I’ve never seen so many in one sighting ~ it was quite spectacular. They lingered for several minutes, which gave me just enough time to capture, in digital through my kitchen window, a couple of them indulging in some Adam’s Ale. And I’m not likely to for a little while either. The water pump broke the other day and we’re still trying to get a hold of the people who installed it so they can fix it. Needless to say, though I do my best to take it in stride, I am perturbed. As much as the bubble rock is a nice rest stop for the birds, squirrels, chipmunks, felines and the occasional naughty puppy dog, it’s also my corner of solitude where I go to read in the late afternoon and catch my breath at the end of the day. I’m actually quite astonished at how unsettled I feel without the sight and sound of soft burbling waters running down the face of this non-descript boulder. It’s my summer panacea; my place to chill; my rock. Not to mention I miss the visits of my feathered friends. 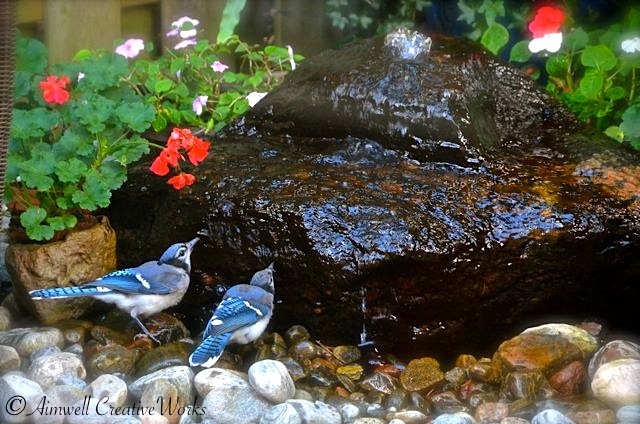 This entry was posted in Garden, Musings, Nature, Photography, Reflections, Thoughts, Writing and tagged Aimwell CreativeWorks, birds, Dorothy Chiotti, gardens, Peace, Photography, summer, water. Bookmark the permalink.